I recently needed to import a custom certificate authority to Firefox on Android. 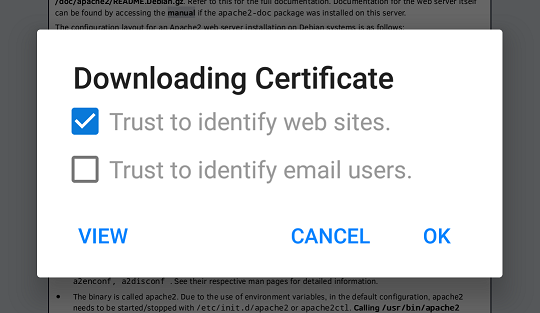 Unlike several other applications on Android, Firefox uses it's own certificate store. After a bit of digging I found this support question which pointed me in the right direction. This post is going to go over importing CA certificates using either Apache or Python. """Serve PEM files using the application/x-x509-ca-cert MIME type"""
"""Run a web server to serve CA certs"""
Note: the script above will listen on port 8000 and serve content from the directory it's being run in.